HP today unveils the first laptop in the OMEN X gaming series. The new device, which joins the OMEN X Desktop in the range, is designed with professional gamers in mind, featuring official support for overclocking and hardware upgrades. The OMEN X Laptop, as it is officially called, comes with thermals optimized for CPU and RAM overclocking, and can be paired with GPUs overclocked from the factory. It comes with two 17-inch display options, a 4K model and a 1080p version that supports 120Hz refresh. The latter is said to offer "smooth visuals". No matter which one you go for, HP says that there's support for Nvidia's G-Sync technology to help with image tearing. The thermals, HP says, involve high-performance fans and an integrated vapor chamber with four 3.5mm pipes to extract heat from the GPU and CPU to the four radiators mounted at the rear corners. HP supports unlocked CPUs with the new gaming laptop, which means that gamers will easily be able to extract every bit of performance from the device. There are Intel 7th-gen Core i7 processors available, XMP memory options for overclocking with profiles tested up to DDR4-2800, and graphics cards up to Nvidia GeForce GTX 1080 with factory overclocking. There are three storage options to choose from: a RAID 0 SSD setup for the best performance, a PCIe SSD coupled with a standard HDD which gives users lots more space and the benefits of an SSD, and a 1TB 7200 RPM HDD, which is the budget-friendly option. HP says that users will be able to upgrade the HDD, SSD and RAM, thanks to easy access to all three via a single back panel. The keyboard gets special attention too, being LED-backlit with 2.5mm of travel and with N-Key rollover. The RGB LEDs can be customized on a per-key basis, and there are customizable maps for the buttons. The OMEN X Laptop also gets a "generous" selection of ports, which lets users hook it up to four monitors. It includes three USB 3.0 Type A ports, two Thunderbolt 3 enabled USB 3.1 Type-C ports, HDMI 2.0a with support for HDR, a mini DisplayPort, RJ45 port, card reader, and dual audio jacks. Also worth noting is that the software is customized as well. 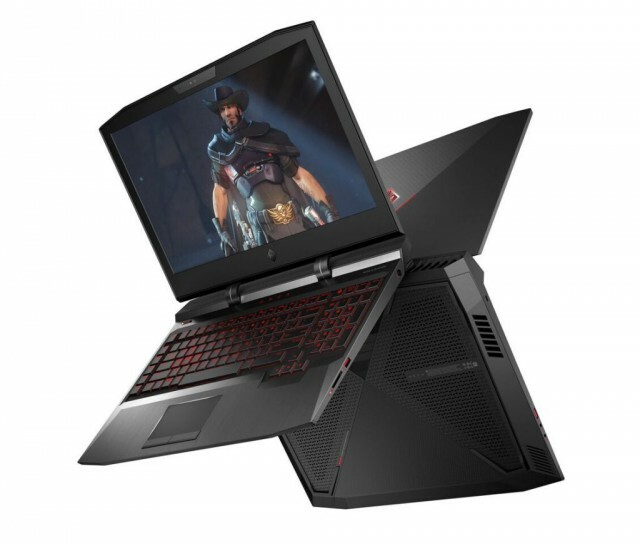 It comes with Windows 10, but there is software to let users take advantage of all the features offered by the OMEN X Laptop, like the overclocking capabilities. Through the OMEN Command Center Software users will be able to overclock the device, optimize the network connection for gaming and personalize the lighting system. There's Audio Boost for better speaker output and DTS Headphone:X for better sound through the headphones. The Omen X Laptop will be available starting in November, with prices kicking off at $2,299.